English Bridge Education & Development (EBED) is a charity registered with the Charity Commission. 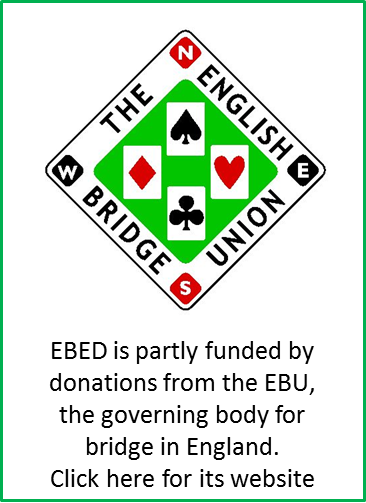 As signalled in its 2013-2018 strategic plan, the English Bridge Union, the governing body for duplicate bridge in England, transferred the majority of its education activities to the new charity. In addition, the EBU Youth and Education Trust and the 1991 Educational Trust for British Bridge have now been closed and their activities subsumed by EBED. We welcome the support of everyone who wants to help secure the future of bridge and encourage more people to start playing. You can help us by sharing your knowledge, ideas and enthusiasm or by making a donation, to help make a difference to society around us. The small grants policy is available here. Our existing initiatives include the putting in place of more and better teachers, providing those teachers with an enhanced range of materials to provide a smooth path from novice to player, as well as a range of youth activities.